You've built a list of contacts and other data that you want to use for a Word mail merge. If your data source is an existing Excel spreadsheet, then you just need to prepare the data for a mail merge. But if your data source is a tab delimited (.txt) or a comma-separated value (.csv) file, you first need to import the data into Excel, and then prepare it for a mail merge. 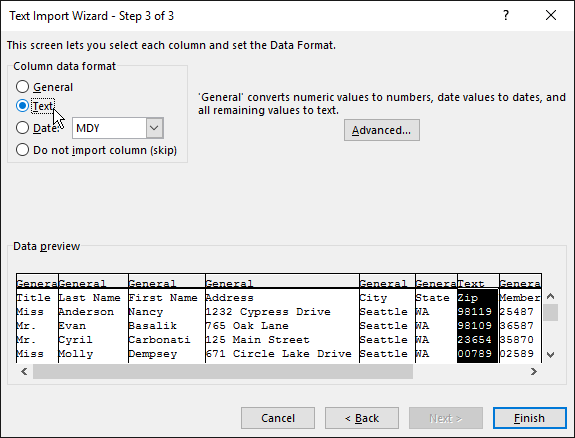 Note: In an earlier version of Excel, you might have used Dynamic Data Exchange (DDE) in combination with the Step-by-Step Mail Merge Wizard in Word. Excel no longer supports DDE. If you'd like us to consider this feature for the next version of Excel, drop us a comment in the Excel Suggestion Box. If you're already using an Excel spreadsheet as your data source for a mail merge in Word, go to Step 2 in this topic. 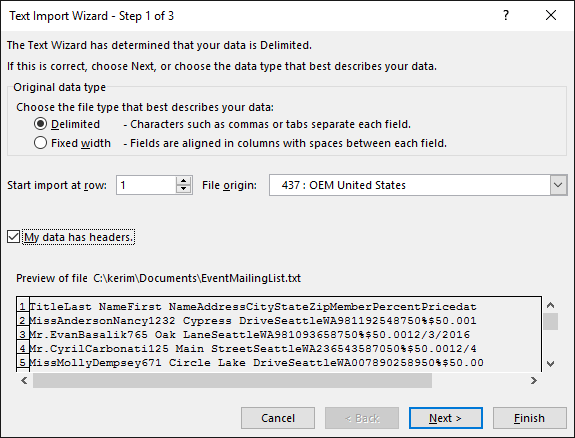 If the data source is a .txt or a .csv file that contains your Gmail contacts, for example, use the Text Import Wizard to set up your data in Excel. On the Data tab, choose Get External Data > From Text. Choose the .txt or .csv file you want, and then choose Import. 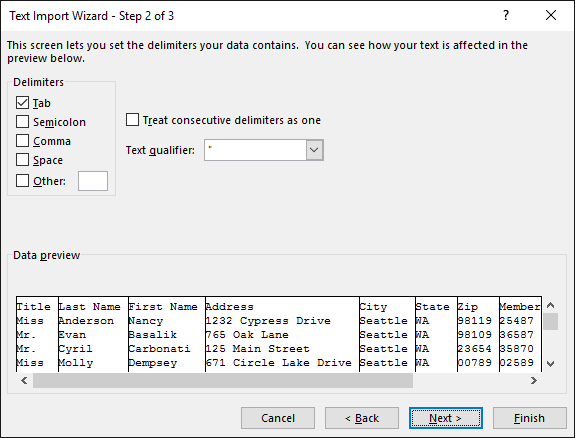 In the Text Import Wizard, in the Original data type pane, choose Delimited. Select the My data has headers check box above the Preview pane if the file you're importing has headers, and then choose Next. In the Delimiters pane, select the check box that matches the delimiter (such as a Tab or Comma) your data uses, and then choose Next. Tip: The Data preview pane shows what the results will look like in a table format. Under Data preview, choose the column that contains ZIP Codes or postal codes, and under Column data format, choose Text. 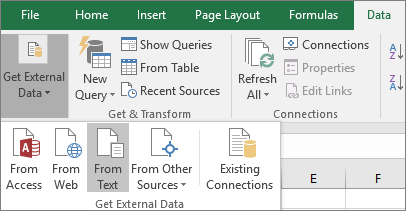 Note: Each time you apply a data format—General, Text, or Date—to a column, the name of the format appears in the table header for that column. Repeat step 7 as necessary, choosing the column you want to change and the data format you want to apply. 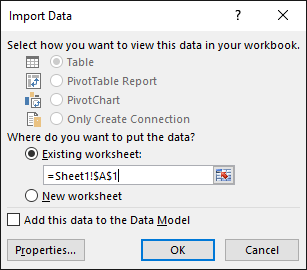 In the Import Data dialog box, accept the default setting of Existing worksheet and the cell address, and then choose OK. Caution: The cell address in the Import Data dialog box shows the currently selected cell. Data is imported beginning with the named cell address. Save your spreadsheet with a new file name. After you successfully import a .txt or .csv file, go to Step 2. In your Excel data source that you'll use for a mailing list in a Word mail merge, make sure you format columns of numeric data correctly. Format a column with numbers, for example, to match a specific category such as currency. If you choose percentage as a category, be aware that the percentage format will multiply the cell value by 100. Format a column of percentages as text if you want to avoid that multiplication factor. Also, a column that contains ZIP Codes or postal codes needs to be formatted as text to preserve the data during a mail merge. Leading zeros—for example, 00399—in codes are dropped during a mail merge if they're not formatted as text. Open your Excel data source and choose the column that contains the ZIP Codes or postal codes. On the Home tab, in the Number group, choose the Number Format (General) box down arrow, and then choose an option in the list. Make sure you add the appropriate symbol before or after a merge field. 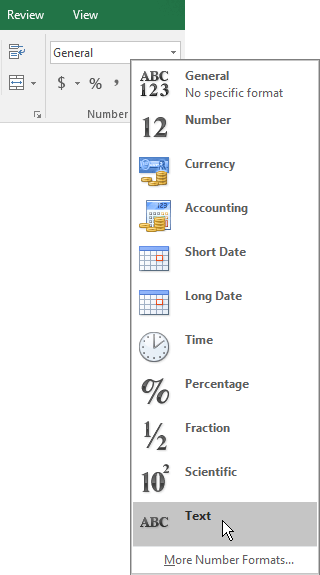 For example, here's how the currency and percentage values look if you omit symbols. If you include the symbols, the numbers make more sense.